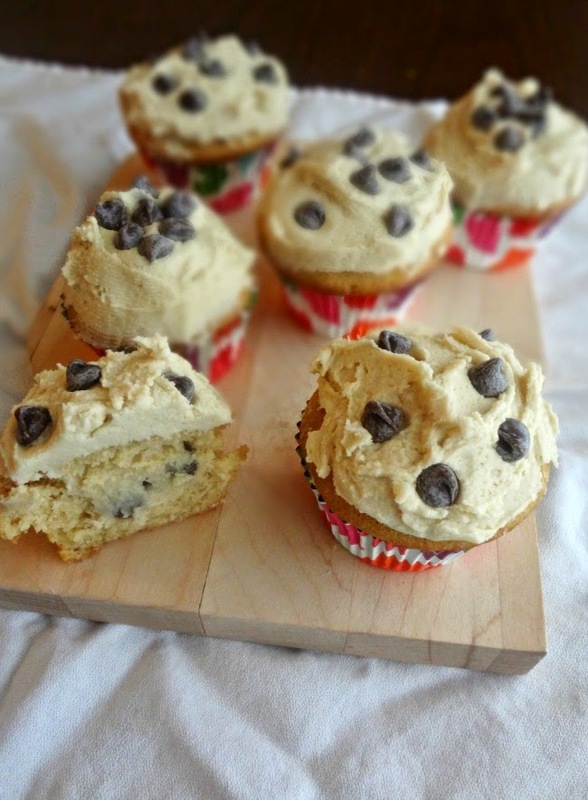 The Cooking Actress: Chocolate Chip Cookie Dough Cupcakes-Cupcake Day! Preheat oven to 350F degrees. Line 12 cupcake cups with paper liners. With a stand mixer or hand mixer beat butter and sugar on medium-high speed until fluffy, about 3 minutes. Beat in eggs one at a time (scraping sides of bowl as necessary). Whisk together flour, baking powder, baking soda, and salt in a medium bowl. On low speed slowly add to the butter mixture, alternating with little bits of milk (beginning and ending with the dry ingredients), mixing each addition until just incorporated. Evenly divide the batter between the prepped cupcake liners. Bake 18-20 minutes, until a toothpick inserted into the center of a cupcake comes out clean. Cool in the pan for 5-10 minutes and then transfer cupcakes onto a wire rack to cool completely before filling and frosting (they should only need about an hour to cool). Beat butter and sugar on medium-high speed until light and fluffy. Beat in flour, milk, and vanilla extract until combined and smooth. Cover with plastic wrap and refrigerate until it's firmed up a bit, about an hour. To fill the cupcakes: using a paring knife, cut a cone shaped portion out of the center of each cupcake. 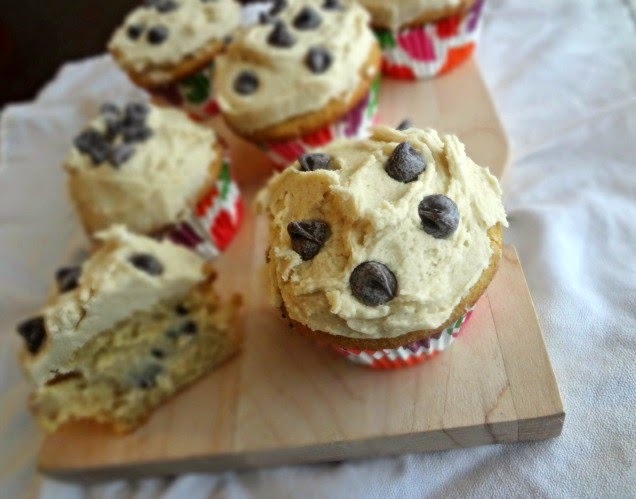 Fill the space with the eggless cookie dough fulling. Cut off (or eat) the cupcake cone you cut out and place the flat top back over the filling. Beat together the butter and brown sugar until fluffy. 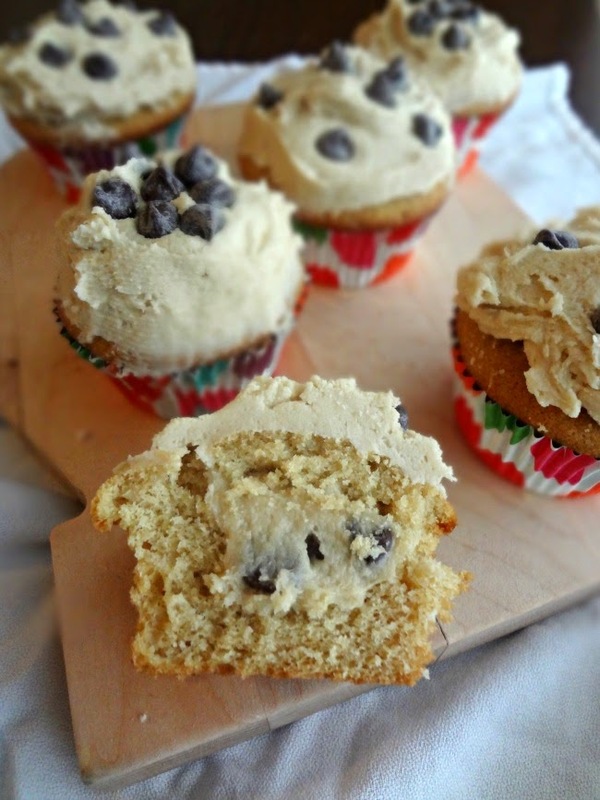 Frost cupcakes as desired. Garnish with chocolate chips and/or mini cookies, if desired. 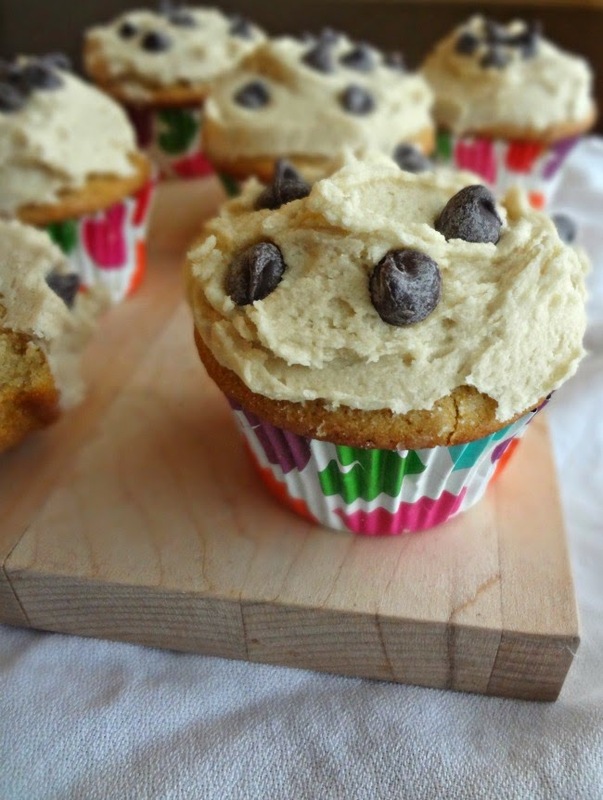 Store cupcakes in an airtight container at room temperature for up to 5 days. And a big THANK YOU to The Redhead Baker for making Cupcake Day happen! !